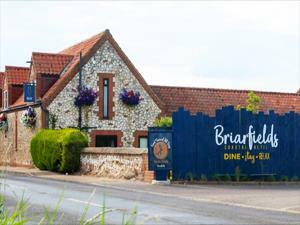 Briarfields Hotel01485 210742work01485 210701fax HotelLocated in the heart of the peaceful North West Norfolk coastline near to Hunstanton, The Briarfields at Titchwell is a hidden gem. Pull off the A149 coastal road and enjoy our tranquil setting and warm welcome. Situated between RSPB Titchwell and Royal West Norfolk Golf course, both overlooking the beach at Brancaster, Briarfields offers peace and relaxation or as much outdoor activity as you choose. Briarfields has extensive views of the big open space of Norfolk's skies and Titchwell salt marshes, which are the natural home for both freshwater and saltwater wildlife. In the winter enjoy sitting by our log fire with a pint of real ale or our special afternoon tea. In the summer take in the views whilst enj9oying a glass of Pimms on the decking. Briarfields has many nooks and crannies for you to find your own space to relax and enjoy time out. An ideal location for holidays, short breaks, weddings and private parties, Briarfields offers a relaxed charm and atmosphere. Many of our guests use us as a base to explore the coast, Norfolk's historical houses and the nearby market towns of Hunstanton, Burnham Market, Fakenham and King's Lynn. Briarfields in situated in Titchwell near Hunstanton on the North Norfolk coast. Take the A149 coast road from Kings Lynn or Cromer and Titchwell is situated between Thornham and Brancaster.